Overview - The Hunter is the story of Martin (Dafoe), a skilled and ruthless mercenary sent into the Tasmanian wilderness on a hunt for a tiger believed to be extinct. Hired by an anonymous company that wants the tiger's genetic material, Martin arrives in Tasmania posing as a scientist. He proceeds to set up base camp at a broken-down farmhouse, where he stays with a family whose father has gone missing. Usually a loner, Martin becomes increasingly close to the family; however, as his attachment to the family grows, Martin is led down a path of unforeseen dangers, complicating his deadly mission. A lonely, isolated creature traversing the beautiful but dangerous Tasmanian wilderness, longing for company that remains forever elusive. In Daniel Nettheim's 'The Hunter,' that somber, tragic picture describes not only the ethereal tiger being pursued, but also the determined man who pursues it. A moody slow-burn thriller about family, friendship, obsession, and man's precarious relationship with the natural world, the film examines the duality of the hunter/prey relationship with marked insight and sensitivity. While the narrative can feel a little thin and underdeveloped at times, a striking performance from Willem Dafoe and some impressive visuals all help to elevate the material, resulting in a captivating but slightly flawed drama. A lone mercenary, Martin David (Willem Dafoe), is hired to hunt down a thylacine, a Tasmanian tiger that is believed to be extinct. Forced to lodge with a local family, the Armstrongs, David poses as a scientist doing research on nearby wildlife. Detached and unemotional, the hunter is at first reluctant to get to know the family, but slowly their kindness wears him down. As he bonds with the two young children and their mother, Lucy (Frances O'Connor), he learns that the kids' father has recently disappeared. In between trips out into the wilderness to track his prey, David grows closer and closer to the trio. A possible connection is formed between the missing father and David's mission, and several dangers emerge, threatening the family's safety. Confronted with the startling motives behind the tiger's pursuit, David will have to decide whether to continue on with his task or follow a new path altogether. The story carries a tranquil, mysterious air that transitions between extended hunting sequences and family drama. We get to see David brave the hostile Tasmanian wilderness in search of the fabled tiger as the elements and landscape pose various dangers. Nettheim employs a dreamy but still visceral shooting style that chronicles David as he goes through his methodical hunting procedure. In sharp contrast to these isolated sequences, are David's periodic trips back to the Armstrong home, where his gradually building relationship with the family shows the usually disconnected man in an entirely different light. Conflicts with local loggers who are suspicious of outsiders, and a growing conspiracy involving the company who commissioned the hunt, all lead to an even greater dilemma, and the script does a decent job of juggling all of these distinct threads. Through it all, the filmmakers wisely keep David's emotional journey toward the forefront, placing a strong emphasis on character development. The thematic parallel between the lonesome hunter and his legendary prey is also paramount to the story, and their potentially tragic fates become irrevocably linked. Willem Dafoe turns in a truly powerful and utterly affecting performance. At first he seems like a standard, emotionless killer, but as the film continues he slowly reveals the possibility for so much more. Important but subtle personality quarks are gradually revealed through small choices, letting us learn about the character through his actions. Dafoe's steady transformation from closed off mercenary to noble father figure is expertly crafted with nuance and heart. Understated but multifaceted, the actor's performance creates a truly complex and fully formed character. The film's two child stars, Morgana Davies and Finn Woodlock, are adorable and natural on screen. Their chemistry with Dafoe is infectious and their scenes together are real highlights. Coupled with Francis O'Connor, the quartet forms a rather unconventional but very believable family unit that rests at the heart of the story. Despite the strong character work and striking visuals, there are some scripting concerns. Certain motivations for several antagonists are hard to pin down, and a subplot involving disgruntled loggers never really works. Likewise, Sam Neil's character, Jack Mindy, is severely underdeveloped. In fact, the whole plot feels like it needs to be fleshed out a bit more, as certain beats and revelations are slightly marred by muddled storytelling. This seemingly deliberate vagueness does help to enhance the movie's mysterious tone, but there are instances where the script walks a very fine line between being appropriately ambiguous, and downright underwritten. 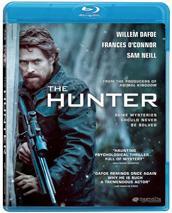 Magnolia Home Entertainment brings 'The Hunter' to Blu-ray on a single BD-25 disc housed in a keepcase. Some skippable trailers play upon start up before the disc transitions to a standard menu. The packaging indicates that the release is Region A compatible. The film is presented in a 1080p AVC/MPEG-4 transfer in the 2.35:1 aspect ratio. Full of many breathtaking shots of the Tasmanian wilderness, the transfer is quite pleasing but does feature a few hiccups here and there. The source print is in pristine shape with some light, natural grain visible throughout. The picture has a comparatively soft look, however, but the image still carries a nice sense of depth and detail. A cool, icy palette casts a blue hue over much of the film, bolstering the story's isolated, mysterious atmosphere. Sweeping aerial shots of the misty Tasmanian wilderness are especially impressive, and the lush, foreboding settings look great in high definition. Whites are bright but black levels are elevated, leading to a flat, washed out look in shadows and nighttime scenes. While not ideal, this certainly isn't a deal breaker, and there is still a lot about the video presentation to admire. Detail isn't exactly sharp, and black levels veer toward grey, but 'The Hunter' still looks very solid on Blu-ray. The film's striking locations lead to some memorable images, and the somber, muted palette complements the movie's melancholic tone. The movie is provided with an English DTS-HD MA 5.1 track with optional English SDH and Spanish subtitles. Subtle but highly immersive, the mix offers an effectively moody and engrossing experience. Dialogue is crisp and clear throughout, and though characters will often speak in hushed tones, speech is prioritized well. The soundfield is enveloping and finely tuned with lots of distinct, isolated effects and disperse ambiance. Delicate sounds -- like wind chimes, pattering rain drops, rustling leaves and crackling fires -- all add rich texture to the mix. Directionality is strong, and surround activity is robust without being overbearing. Though the film does have many quiet stretches, the track is never truly silent. The natural aura of the Tasmanian wilderness comes to life throughout the room with appropriate atmospherics. The movie's stirring score also comes through well and features nice separation. Dynamic range is wide, and more aggressive effects (like gunshots), carry a loud, permeating kick. With its artfully balanced sound design, the film's 5.1 mix offers a fantastic sense of natural immersion. Subtle but extremely effective, the track suits the movie's haunting mood perfectly. Commentary with Director Daniel Nettheim and Producer Vincent Sheehan - The director and producer offer a solid track full of production trivia. The duo focuses on casting, working with the child actors, and dealing with the remote Tasmanian locations. Technical details on how certain shots were accomplished are also provided, and some of the differences from the source novel are detailed. While the conversation can get a little dull, the participants keep the discussion going with a very steady stream of facts and anecdotes. Making of the Hunter (HD, 33 min) - Viewable in four separate sections ("The Story," "The Characters," "Tasmania," and "The Tiger") or all together, this is a fairly comprehensive look at the film's production. Interviews with cast and crew are interspersed with behind-the-scenes footage detailing the movie's casting, locations, character arcs, and shooting methods. Some discussion is also dedicated to alleged Tasmanian Tiger sightings. Deleted Scenes with Commentary (HD, 7 min) - Seven deleted scenes are viewable together (with chapter breaks) with or without director's commentary explaining why they were cut. The excised bits offer more interaction between David and the kids, and a little more development for Sam Neil's character. Theatrical Trailer (HD, 2 min) - The film's trailer is presented with Dolby Digital 5.1 sound. 'The Hunter' is a somber, slow-burn thriller seeped in mystery and tragedy. Willem Dafoe turns in a truly impressive performance, and while certain plot points are underwritten, the film is emotionally satisfying. The video transfer is solid and the audio mix is very strong. Supplements are slim, but the included commentary and behind-the-scenes featurette offer some welcome insights. Though flawed, the film is still quite good and this disc is definitely worth a look.